I saw this video a few weeks ago and thought it would be a neat idea to attach an arm to my makiwara, like this guy did. After thinking about how he built it, it looked like the modification might be permanent, and I’d like to be able to remove the arm for other training options. 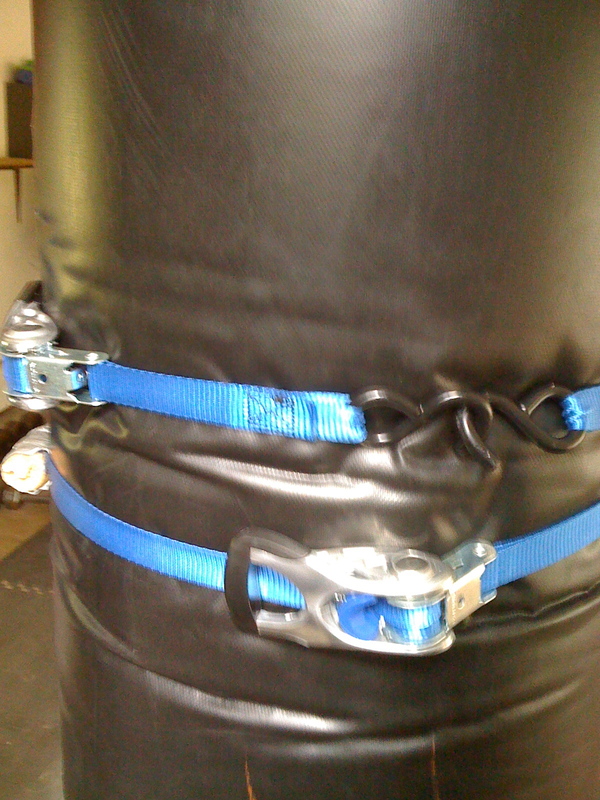 So, I decided to go a different route by adding arms to my free-standing heavy bag. 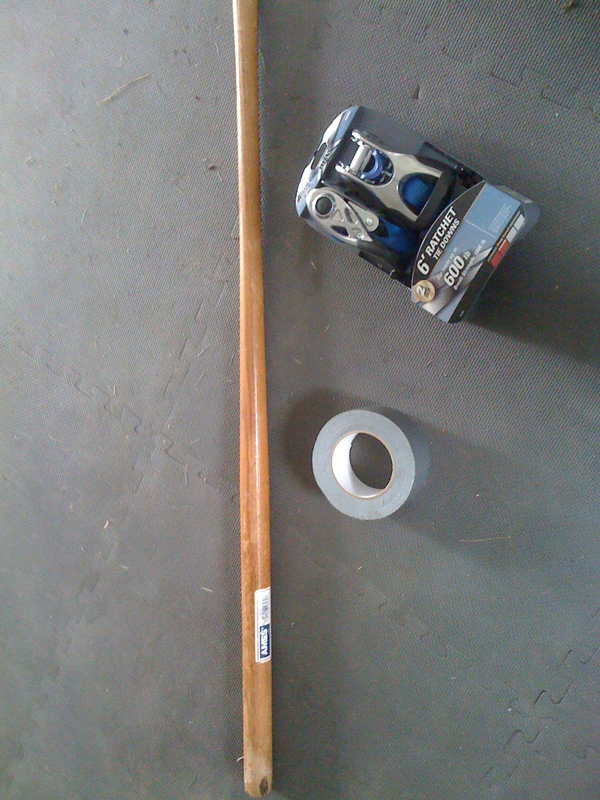 Step One: get wooden handle, ratching tie-downs, handy duct tape. First I sawed an old shovel handle I had lying around into two “arm-sized” pieces. Then I taped them to the ties. You really can't use too much. Be sure to tape close to the hook. This way, the arm will attach to the side of the bag leaving enough wood to block. I formed a loop with the tie and slipped it over the top of the bag. It’s a little hard to ratchet it once it’s on, so I had to experiment a little with the size of the loop before tightening it a little extra to make it stay. Start with a tight fit for success. Finally, I leveled the arms and tried out some of the techniques from the video. It works pretty well, plus you get two to play with. They move around a little bit, so you’ll have to readjust after awhile. It’s nice to practice pivoting and turning movements while blocking and countering with punches or kicks like in Uechi-Ryu hojo undo exercises. You can also drill agile fighting combinations–à la Lyoto Machida. You can’t do that as easily with a makiwara. One last thing. I left a rough cut on the wood and scraped my arm. I remedied that with some sand paper and more duct tape. Also, I had a spare piece of pool noodle lying around (see pic above) that can be used to soften the impact. You’d have to tape that too if you want to use it. 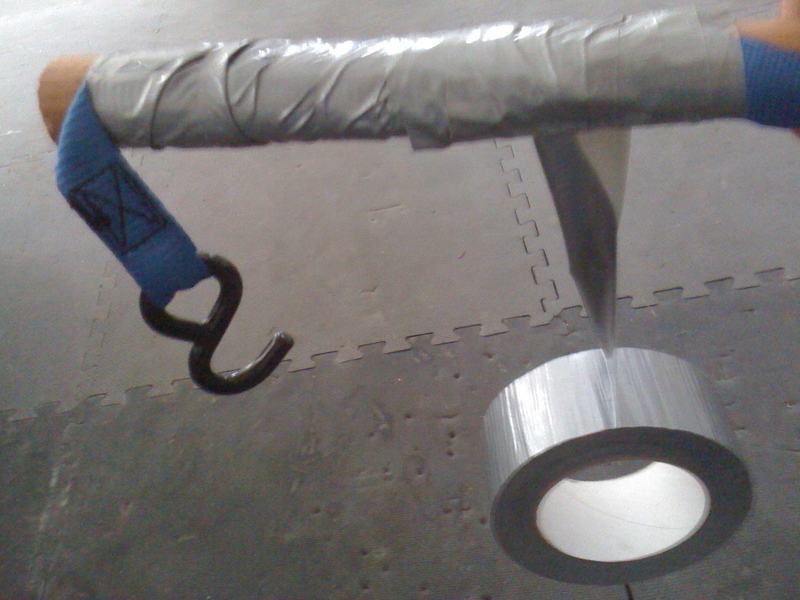 Do you have any other DIY martial arts training tools? If so, let us know. 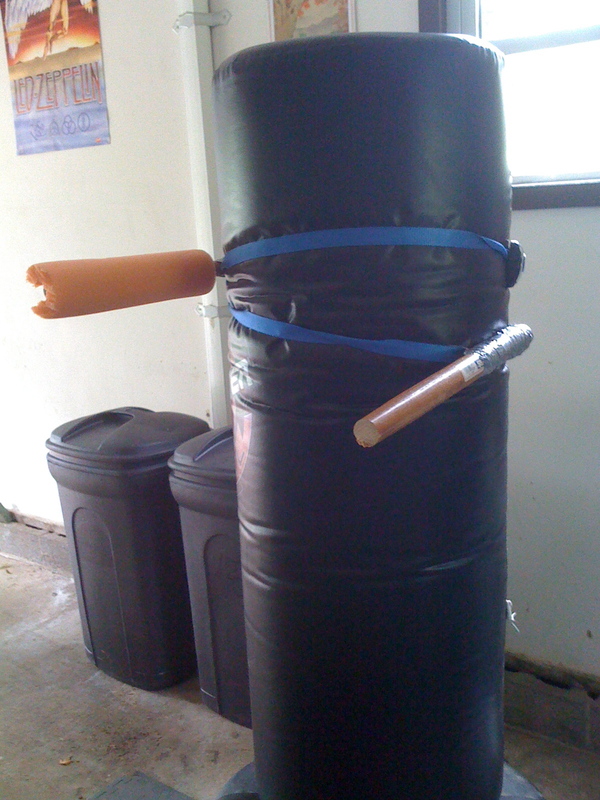 This entry was posted in Equipment, Karate and tagged DIY, DuctTape, karate, Lyoto Machida, shohei-ryu, Uechi-Ryu. Bookmark the permalink. Very interesting! I’ve always thought adding an arm element to bag training would be beneficial, and it looks like you’ve come up with a creative solution. In my opinion one of the best forms of martial arts is Brazilian Jujitsu and one of the best teachers is Marcus Soares http://www.marcussoares.com who has a Vancouver jujitsu club and is considered one of the best instructors in he world. He is a direct student of Carlson Gracie and is the highest ranking BJJ black belt under Carlson with 7 degrees. I think BJJ and grappling id the best for mixed martial arts. I’m not sure why this reader may have posted a spam comment, but the website is relevant to our discussions and it’s really cool. Take a look if you get a chance.